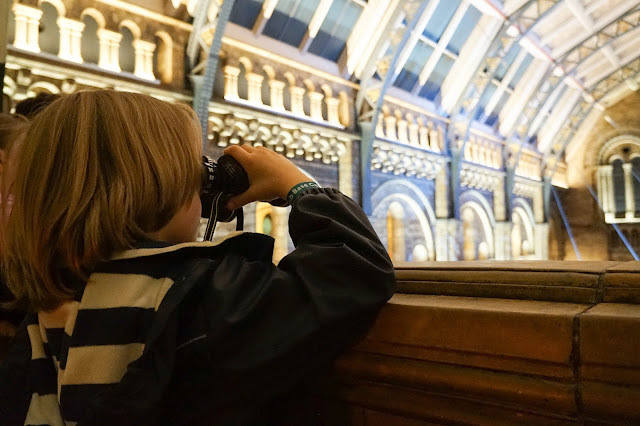 Like many kids his age my 7yr old is obsessed with Dinosaurs and natural his also a fan of the Night At The Museum films so the idea of sleeping over at The Natural History Museum as part of Dinosnores was a dream come true on more than one level. Dinosnores runs throughout the year and makes this magical experience a reality for children aged 7-11yrs old and I whole heartedly recommend this, we had a blast. 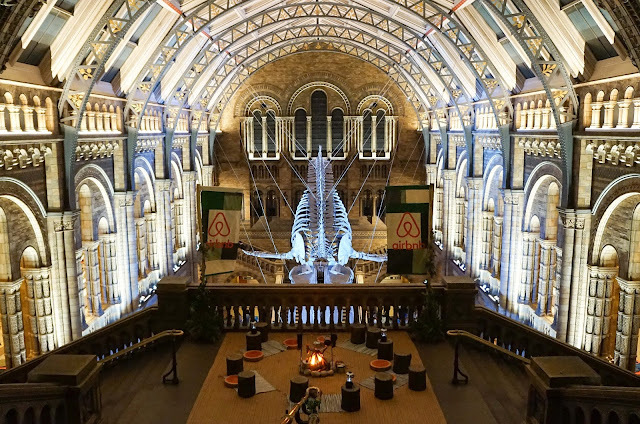 What makes this next year extra special is Airbnb and have collaborated with Dinosnores to offer raffle places to ticket holders to be in the chance of getting one of the coveted Base Camp spots, located at the top balcony of the Hintze Hall besides the 1300 year old giant sequoia overlooking the huge blue whale skeleton, I mean talk about a view! As soon as we arrived at the Natural History Museum the atmosphere was buzzing with so many excited children. 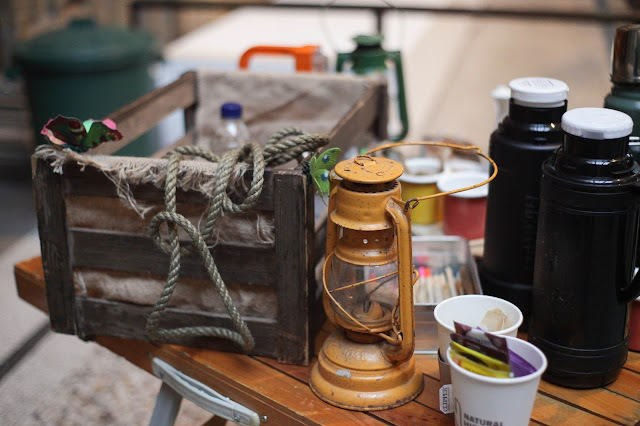 Despite there being a fair few school classes, cubs scouts and larger groups it was so well managed that it didn't feel packed or manic and the staff were so professional and efficient from start to finish. We were on the lookout for the Airbnb flag holder who then took us to the rest of the group before heading up to the Airbnb Base Camp tents, I think he Base Camp only has 20 beds and so much detail had gone into dressing up the area in an authentic vintage camping style. An actor playing the character of Captain John Fishing met us at the base of the stairs taking us to the communal camp fire where he told us tales of his adventures before getting comfortable in our beds and settling in before joining the rest of the campers in a variety of activities planned for the evening. 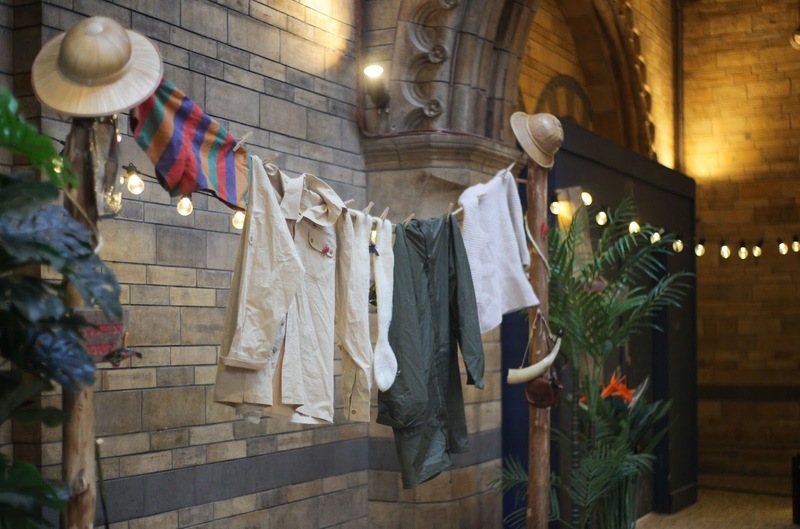 There was also a box full of dressing up clothes for the kids and my eldest opted for a 1950's explorer, all ready for what an evening of adventures. 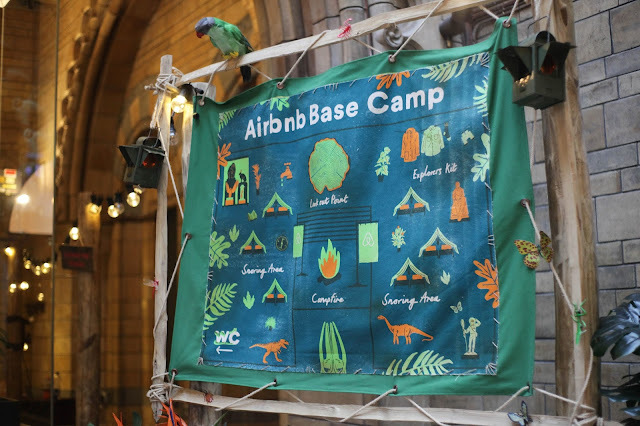 While the Base Camp was absolutely fantastic and a really special experience we would equally have enjoyed it just as much camping with the larger groups downstairs. 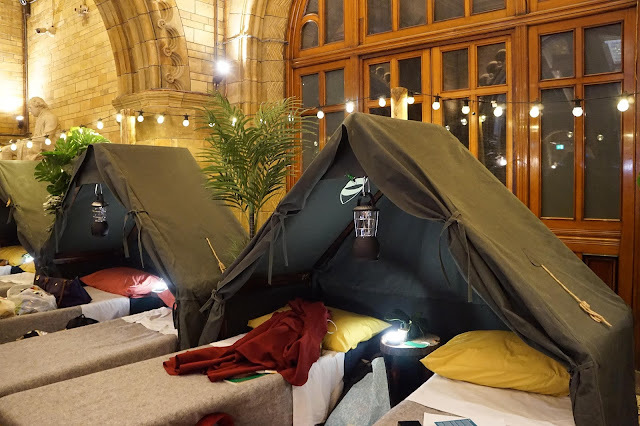 When camping as a group the Natural History Museum provides you with a foam mattress but many bought their own to double up and make things more comfortable so this is a good tip and just a standard sleeping bag will do you well anytime of the year, we were here during winter and while it did get a tiny bit chilly at night it was too bad as the museum is pretty well insulated. 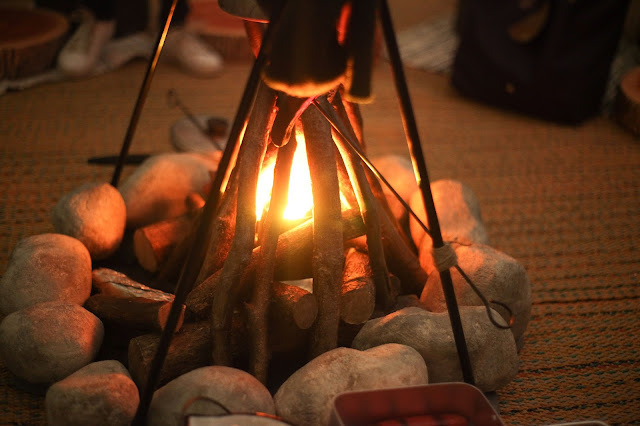 Once we had settled into base camp, had a little debriefing around the camp fire and met the other Base Campers we headed off to our first activity which was a fun and engaging lecture on Sharks and prehistoric marine life. 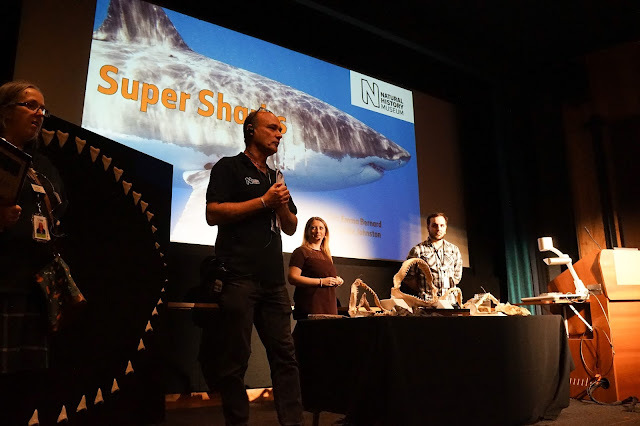 The Museum Scientist which took the lecture was informative and humorous made the lecture both entertaining and educational, everyone also had a chance to pass around a Megalodon tooth which is a real hit with all the kids. 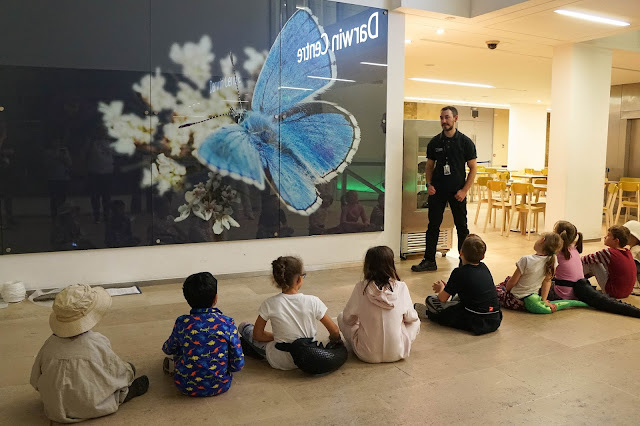 Next up was a Dinosaur t-shirt designing workshop which allowed the kids to get really creative and design their own Dinosnores t-shirt to take home the next day, using fabric crayons and stencils. Once again this was an educational but hands on workshop and everyone really enjoyed it from the 7yrs old to the older 11yrs old. After the first two activities we headed back to base camp for snack time, even though we ate before arriving it's a long evening and the ask everyone to bring a light meal or snack for the evening this also gave everyone a little bit of time to socialise and the kids to strike up a few friendships with some like minded Dinosaur fans. 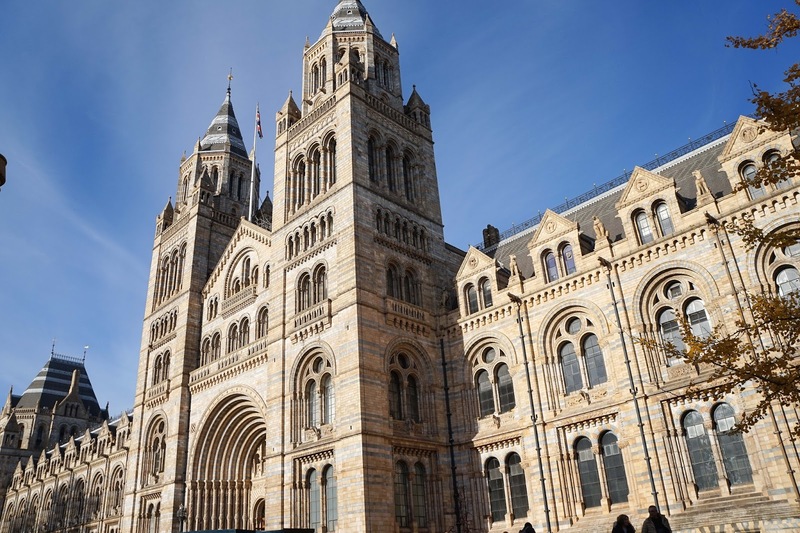 After snack time we headed down to the Dinosaur exhibition and the much anticipated torch light treasure hunt in search of answers which would be discovered once you had found all the different rubbings and a picture would be revealed. 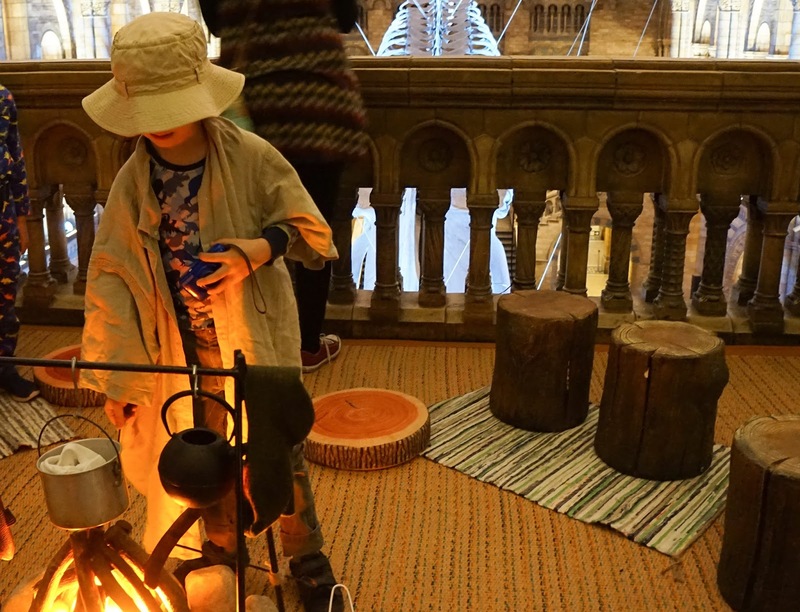 As soon as the children had been briefed to what their mission was with much excitement they ran through the dark exhibition with torches in hand and coming close up to the moving T-Rex. It was a fantastic way to finish the evening and a highlight for all. Pretty tired by this point we headed back up to camp, enjoyed talking a little longer around the camp fire before getting ready for bed and just taking the surroundings in. 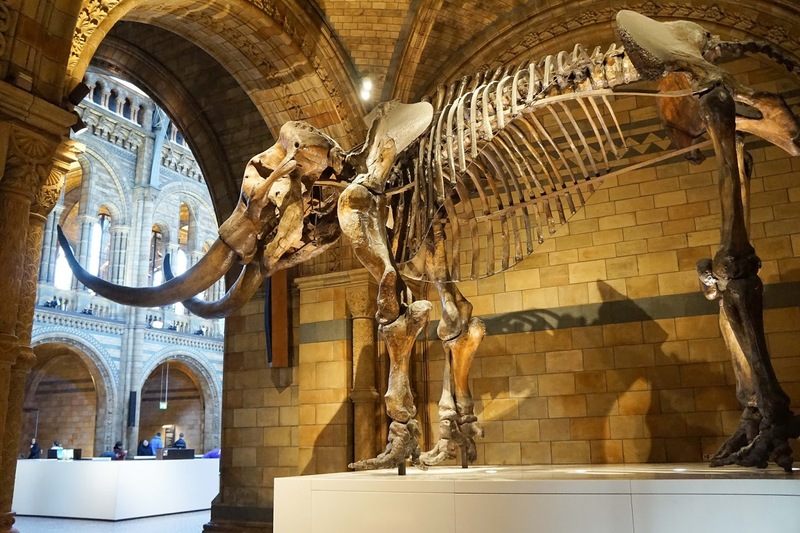 There was lots of hassle and bustle but as soon as the lights went out at midnight pretty much a silence fell on the museum and everyone seemed to drift off to sleep quickly. We woke up around 7am and got dressed and packed up before having a mess style breakfast, of course things move pretty quickly in the morning as they have to get everything ready before the museum opens at 10am. So after a muffin, yogurt and cup of coffee (for me not my 7yr old of course) we said goodbye to Base Camp and headed downstairs but this wasn't the end of the experience in fact we were in for a treat with the live animal show. The handler was clearly very passionate about his array of snakes, meerkats and spiders and despite there being a lot of children and of course because of the large numbers getting up close with the animals besides birthday children was simply not possible but the show was still very entertaining and engaging. After everything wrapped up we had around half an hour to explore the museum before it opened to the public so we made good use of this and in fact ended up spend another two hours wandering around all the fantastic exhibits before having a bite to eat and heading back. As it was such a glorious sunny day (although still cold, it was winter time after all) we decided we would walk through Hyde Park back to Paddington Station and thats what I love about central London is how walkable it is. We made sure to stop by the Peter Pan statue on the way and spot all the swans on the lake before saying hello and goodbye to Paddington Bear and heading home back to Cardiff feeling tired, excited and in awe of what a wonderful time we had. 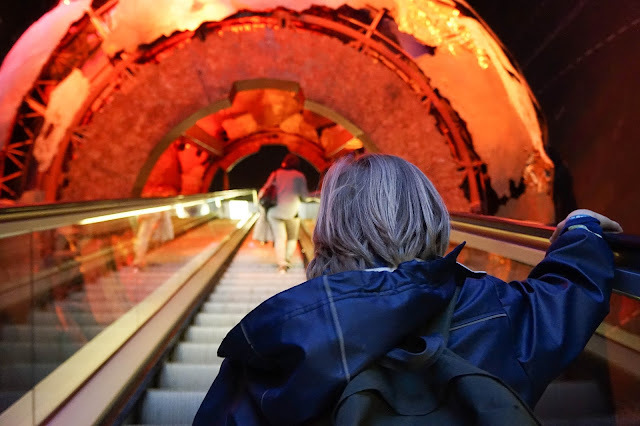 Please do check out our vlog from the experience and we highly recommend Dinosnores. Thanks to the Natural History Museum and Airbnb for having us. Oh wow, what an AMAZING place for a sleepover. I went to a sleepover in the Bug House at London Zoo once, that was pretty special! What an amazing time it looked like they all had. Wish I got to do things like this when I was that age! This looks incredible, how amazing is this?! I wish this kind of thing was around when I was that age. Wow, this is so cool. Indeed this is a great experience especially for kids. I love that there is somehow an interactive activities for the kids. 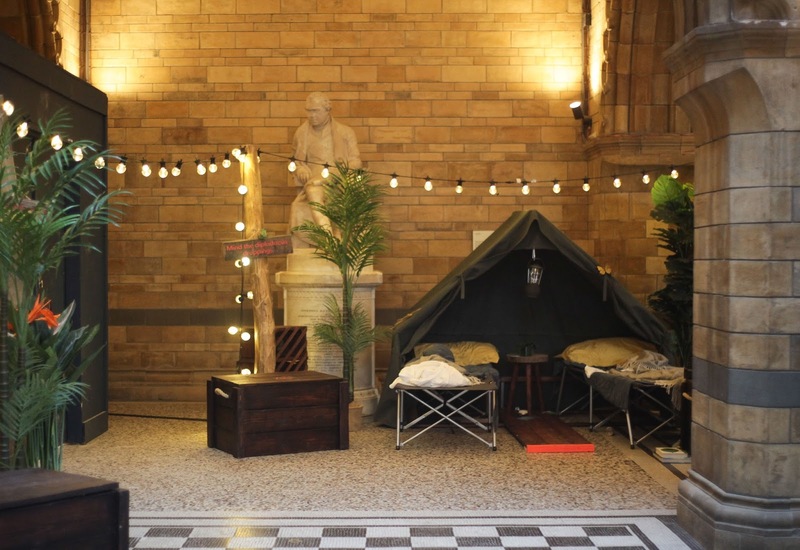 This is one of my all time favourite places I can't believe you got to spend the night there Laura - how awesome! This sounds magical. My kid would love to experience this for sure. Now that's a sleepover and a half!!! What a super cool idea, and it sounds great fun. My dino mad monster would love it!!! Wow, wow, wow! What an experience. I would love to try this out for myself. What a cool idea. Would love to perpetually get updated outstanding site!